Two of Australia’s most influential alternative bands have teamed up for a co-headlining tour of the UK and Europe in March 2019. COG will embark on their first ever European tour and their first UK shows in 11 years, since their legendary sold out show at London’s Shepherd’s Bush Empire back in 2008 (with New Zealanders Shihad). The progressive power trio have immense cult recognition for their landmark records The New Normal (2005) and Sharing Space (2008), featuring intensely political lyrics, formidable riffs and polyrhythmic patterns conceived by legendary drummer Lucius Borich, bassist Luke Gower and the unique stylings of Flynn Gower (vocals/guitar). The band have gone from strength to strength since reuniting in 2016 after a 6-year hiatus. New single ‘The Middle’ was released last year to critical acclaim and significant radio play on national broadcaster triple j. The band have also sold out three national theatre tours and headlined major festivals in Australia, including 3 x sold out nights at Sydney’s iconic 1,200 capacity Metro Theatre. As the band post updates from the studio, anticipation for a new COG album is growing and the band will celebrate their first overseas tour with the release of new music. New track ‘Altered States’ is out now. 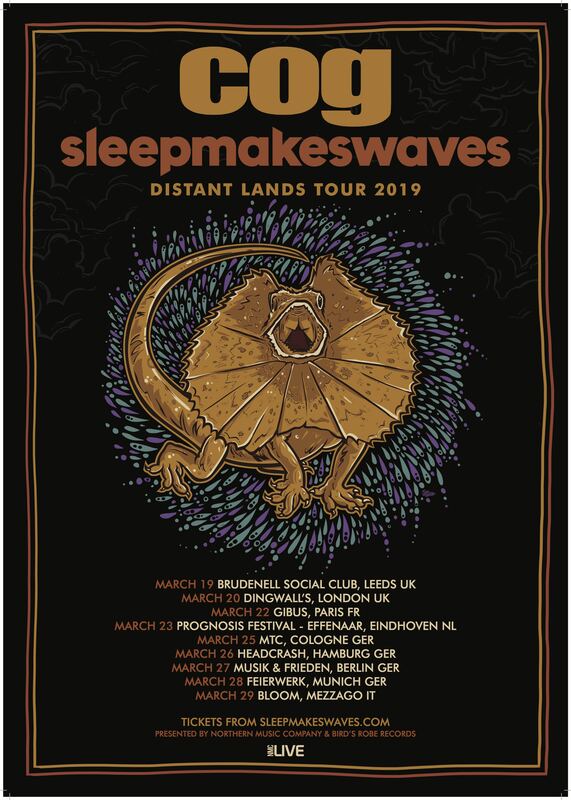 sleepmakeswaves are well-loved on the European continent and return for their sixth European tour, celebrating 10 years since their debut EP was released. The band last toured the UK and Europe in 2017 in support of their acclaimed third album Made of Breath Only and are currently riding high on the success of their reimaginations of the Robert Miles classic ‘Children’ and Metallica’s ‘To Live is To Die’ racking up over 1 million views. Continuing the anniversary tour theme they kicked off in Australia & India this year, the band will perform songs from throughout their repertoire including their ARIA-nominated albums Love of Cartography (2014) and …and so we destroyed everything (2011). sleepmakeswaves’ brand of instrumental post-rock is known for their thundering climactic sequences, memorable melodies and electric flair on stage. They have graced the main stage at ArcTanGent, AM Fest, Dunk Festival, Bergmal Festival, Euroblast, ProgPower and India’s NH7 Weekender, as well as touring with iconic prog, post and metal acts such as Karnivool, Underoath, 65daysofstatic, Opeth & Devin Townsend. In March 2019, both bands will bring their unique take on progressive music to the newly minted Prognosis Festival in the Netherlands in March, alongside Haken, Soen and Witchcraft. They will also play 2 exclusive UK headline shows in Leeds and London, before heading on to play several club shows in Germany and Italy throughout March. In COG we trust. If you grew up in Australia during the alternative boom of the 2000s, you’d have seen these stickers and shirts by the thousands across venues and fans at shows. Indeed, it was COG who spearheaded a wave of new progressive-minded music coming out of Australia that featured the rise of acts such as The Butterfly Effect, Karnivool & Dead Letter Circus, whilst inspiring countless others. The scintillating combination of superstar drummer Lucius Borich along with the brooding melodicism of Flynn Gower (vocals/guitar) and the thunderous groove of bassist Luke Gower was captivating for a young and eager nation of rock fans. Blending at once the spirit and feel of classic trios such as The Police alongside a mentality and penchant for heavy rock akin to Tool, Helmet, Deftones and the melodicism of a Stone Temple Pilots or Smashing Pumpkins, the band were a revelation for many: a heavy, technically-minded rock band who could make you feel. After a legendary residency at Sydney’s Excelsior Hotel proved their break out stage (8 months of sold out Wednesday night shows, no less), their twin set of debut EPs Just Visiting were followed by the success of Gold-selling The New Normal in 2005, which saw them crack the charts and become a bona fide festival headliner across the nation. The 2008 follow up Sharing Space saw their star rise further, with a J Award nomination, and heavy touring, including bringing out UK alt-rockers Oceansize to support them in Australia, whilst themselves heading across the pond to sell out a massive one-off London show at Shepherd’s Bush Empire. It seemed as though the power trio with biting commentary on the world around them and equally cutting edge music were on the cusp of reaching an overseas audience ready to welcome them with open arms. However, as families and financial commitments grew, the band took an indefinite break in 2010 after yet another sold out run of shows. COG got turning once more with a 2016 reunion tour of the nation (with special guests and long-time admirers sleepmakeswaves) during which they told audiences they’d begun writing new material again, and now here we are with our first taste, ‘The Middle’. Evolving through an acoustic-led intro, an atmospheric build, and shifting into titanic grooves, ‘The Middle’ shows that the prog-rock chemistry of the trio – guitar wielding brothers Luke and Flynn Gower and drummer Lucius Borich – is all still intact. Premiered on triple j, the six-minute track is a big deal – not just in scope but because fans didn’t think they’d ever get a follow-up when Cog called it quits. So beloved were they that The New Normal even cracked the Top 50 of triple j’s Hottest 100 albums of all time vote back in 2011. With the announcement of new music, it was no surprise that the devoted picked up right where they left off. With now a trio of sold out homeland tours under their belt, COG have now cast their eyes abroad to the fans who never got the chance to see one of their country’s most legendary alternative bands. Having been introduced to sleepmakeswaves through mutual friends (Drew & Kenny from Karnivool), the bands toured together and formed a lasting respect and friendship. It’s therefore fitting that the young post-rockers should be sharing space, quite literally, on their first time abroad. Reunited, reinvigorated and as powerful as ever…there’s plenty more to come from COG. Hot on the heels of ‘The Middle’ now comes ‘Altered States’ an explosive prog odyssey which harks back to classic COG form. It’s been a crazy ten years for sleepmakeswaves, the little Sydney quartet who dreamed big. Hundreds of shows amongst 15 Australian tours, 5 European tours, 2 North American tours, 2 Asian & New Zealand tours. Critical acclaim including 3 ARIA nominations, 2 AIR Award nominations and a nomination for a J Award, amongst highly rated reviews from Rolling Stone, The Music, The Independent and more. Airplay including 3 songs added to triple j rotation, spending a combined 20 weeks in the CMJ Top 200 at US college radio and airing on BBC6. Even a glimmer of brief commercial success with 2 ARIA Top 40 albums and a #1 spot on the 100% Independent Chart for ‘Made of Breath Only.’ They even cracked the Top 100 in Kazakhstan. Formed via an ad on Myspace (remember that? ), the band’s story started online and they continue to benefit from fans sharing their music on the internet. From their debut unexpectedly clocking up 50,000 downloads online, to hitting 200,000 views as the soundtrack to a romantic ‘Twilight’ movie fan video, or as the thumping opening theme for the AFL football season coverage on Channel 7, sleepmakeswaves’ music has always taken a life of its own amongst fans online. Recently, their triple j Like A Version tribute to Robert Miles’ ‘Children’ hit close to 1 million spins online, whilst the band’s Spotify listeners top 1 million worldwide. However, the story of the band is not complete without a nod to the work put in on the live stage. Amongst the 300+ live dates played over the past few years, the band have visited 30 countries and headlined sold out shows on four continents. They’ve played festivals including SXSW, ArcTangent, Euroblast & Dunk Festival. They’ve toured with and befriended a host of iconic and diverse acts – Karnivool, COG, Devin Townsend, Underoath, Russian Circles and many more. They’ve forged links with and created touring opportunities for many of their international peers in Australia – 65daysofstatic, Rosetta, The Contortionist, This Will Destroy You and more. They fulfilled a decade-long dream in their hometown by headlining Sydney’s iconic Metro Theatre to a packed house and recording the show for triple j’s Live at the Wireless (going on to headline there several more times). Despite all these unprecedented milestones, most importantly, their biggest achievement has been to endure and continue making music and performing for their fans. Through lineup changes, an ever-more-difficult economic climate for independent niche artists, theft of money and equipment, computers crashing, lost baggage, injuries, illness, operations, failed relationships, fire alarms, red tape and more, this band has maintained the passion and enthusiasm to continue creating. Their fans have supported them – through pre-order campaigns to make new albums, through ticket sales, merch sales and social media, through images shared of tattoos, gifts of birthday cakes in Poland, drinks in Hungary, videos of cover versions from India, tour guides in China, or just a handshake and a smile at the merch desk after the show. So…this tour is a celebration of all that. A way to say thank you for everything, with a quick glance backwards, before continuing on with many more new things to come. And what better way to do it than alongside friends and heroes of the alt-rock scene in Australia, the mighty COG. Expect plenty of fan favourites, a few surprises and one heck of a live post-rock show from this hard-working still-young band.